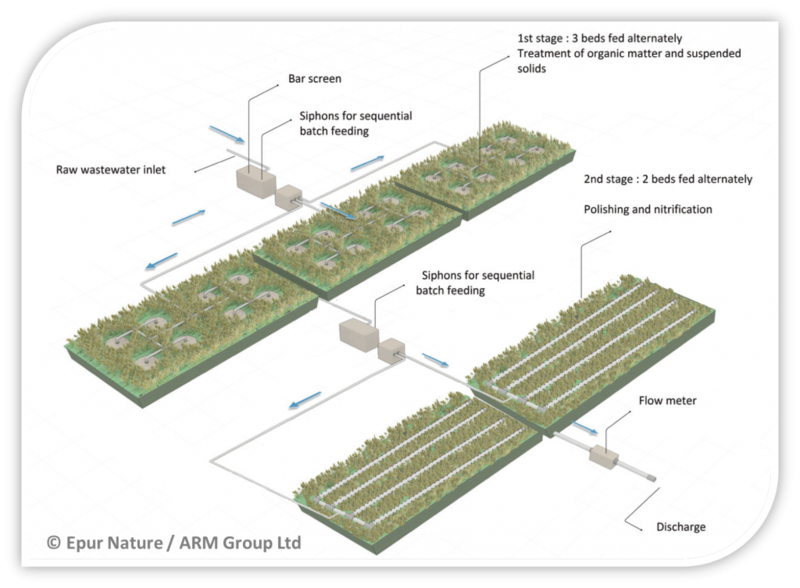 Phragmifiltre® is the first reed bed technology in the UK that provides complete treatment of macerated or raw sewage in one wetland system, with no pre-settlement using little to no power. This signifies a major change in thinking towards a natural and sustainable alternative for sewage treatment in the UK where reed beds have been traditionally used as a secondary treatment after settlement and as tertiary treatment to polish effluent prior to discharge. Developed in France, the Phragmifiltre® requires no pre-settlement, only screening and/or maceration of raw sewage . The system is typically designed to have two stages. The first stage filters which has three or more beds and de-waters the solids from the raw sewage on the surface of the reed bed. Macerated/screened sewage is fed to each bed in rotation thereby allowing all the beds to have a rest period. The filtrate passes down through the beds which act as a typical vertical flow reed bed reducing BOD primarily but also undertaking nitrification of ammonia. The second stage of vertical flow reed beds provides additional BOD reduction and completes the nitrification of ammonia prior to discharge. The use, where possible, of siphon technology for dosing at both stages minimises power requirements. The mineralised sludge accumulated on the first stage beds is removed once every 10-15 years and can be applied to land as it meets “enhanced treated product” status. Conventional sewage treatment works (STWs) generate sludges which have to be taken from small rural works for treatment. Phragmifiltre® stores and composts sludge on-site for a minimum of 10 years, therefore no tanker costs and no roadways are required which minimises OPEX and CAPEX costs.